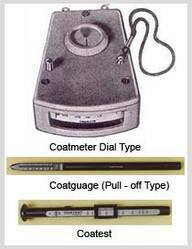 Fixed probe type Coatmeter is a family of Coatmeters designed on the magnetic principle. It is available in three different models and customer can select the appropriate model depending upon his accuracy requirements and application. All these models are useful for measurement of thickness of non - magnetic coating on magnetic base material. As Plating : Gold, Copper, Zinc, Tin, Chromium, Hard Chromium, Lead etc. As Coating : Paint, Insulation, Resin Coating. As Lining : Resin, Rubber, fiberglass. As Film : Plastic, non - magnetic Metal foils. New Concepts & Systems is totally dedicated and committed to manufacturing and marketing of Industrial Equipments. New Concepts & Systems was established by an entrepreneur, Mr. Charuchandra M. Nerurkar in the year 1990. New Concepts & Systems has spread itself to Navi Mumbai and it continues to forge ahead through innovation in manufacturing and marketing in line with customer demand to reach out to the whole world. Soon.New Concepts & Systems is also going to spread its branches at Pune & Banglore.